#12/11 Terriers dropped a 4-1 decision to Northeastern at Agganis Arena Saturday night. After shutting out Providence on Friday, BU wilted under the pressure of the Huskies' forecheck and strong cycle in the offensive zone. Just after BU killed off a penalty midway through the first period, NU's Bobby Hampton took a pass in the slot and beat Jake Oettinger for a 1-0 lead. Then, in the final seconds of the period, Nolan Stevens stripped a Terrier defender and broke in alone on Oettinger, beating him five-hole with less than a second remaining. Early in the second, BU cut the lead to 2-1 on a power play goal as sophomore Patrick Harper circled the Husky cage and, from the right wing boards hit junior Jordan Greenway with perfect pass at the goalmouth for a redirect into the net. Just seven minutes later, Stevens restored the two-goal margin, rapping home a rebound. An apparent Brady Tkachuk goal from close in was waived off after it was determined the ref's whistle preceded the puck crossing the goal line. The late in the second Stevens completed his hat trick, deflecting a shot past Oettinger. 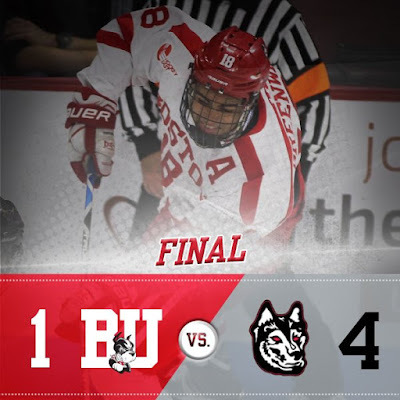 BU poured 14 shots on the Husky goal in the third period, but couldn't put one past Cayden Primeau, who had relived Northeastern starter Ryan Ruck midway through the game. As is often the case when BU and NU meet, there were multiple dust-ups between players. BU senior Nikolas Olsson received a game misconduct for contact to the head. Kevin Shattenkirk scored his third and fourth goals for the NY Rangers last night, with the latter being the game-winner in overtime as the Blue Shirts defeated the Florida Panthers in Sunrise, Florida. This was the second consecutive game in which the former BU All-American scored on an OT game-winner. Shattenkirk is currently the fourth leading scorer among NHL defensemen. Clayton Keller scored his 10th goal of the season and added a shootout tally in a 2-1 Arizona win against Carolina. Keller, who led BU in scoring last season, is the top NHL rookie goal scorer (10) and point scorer (16). Former BU All-American and Hobey Baker Award winner Matt Gilory was among ss former Terriers inducted into the BU Athletics Hall of Fame last night. Gilroy, who co-captained BU to the 2009 NCAA Championship, is currently playing in the KHL and has been named to the preliminary roster for the 2018 U.S. Olympic Team that will play in South Korea in February. Future Terriers Trevor Zegras, Case McCarthy and Alex Vlasic and the NTDP U17s begin preliminary round play in the World U17 Challenge today. Team USA takes on the Czech Republic. 2020 recruit Donovan Sebrango assisted on a pair of goals in CIHA Midget White's 5-4 OT loss to Pembroke U18 in an HEO league game. The blueliner has 10 points in 11 games and is second on the team in scoring.